Choro (pronounced SHOH-roh) is best described in American terms as "the New Orleans jazz of Brazil." It is a complex popular musical form based on improvisation, and like New Orleans jazz, blues, or ragtime, grew from a formalized musical structure and many worldly influences. 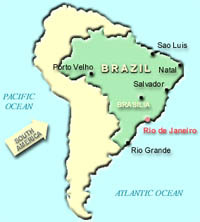 But to the people of South America, choro is Brazil. It is life. The word choro in Portuguese literally means "to cry," which seems like an ironic name for music that is often so joyous and celebratory. Actually the term refers to the lilting or "weeping" qualities of the solo instrument, usually a flute or clarinet (Think of the way Benny Goodman could "wail"). This music, also called chorinho (this term refers to the individual pieces of music), came of age in the early 20th century in the cafés of Rio de Janeiro and other large cities in Brazil. The traditions that nurtured the choro in Rio in the late 1800s are pretty much the same ones that brought about the danzón in Cuba, the beguine in Martinique, and ragtime in the United States; countries were developing their own popular musics and began to mix elements from other cultures including European polka and African rhythms. As flutist Paula Robison explains, "... the choro tradition in Brazil is very much like the blues in America. In Brazil, choro was the combination of the African tradition mixed with the Portuguese; the beautiful singing lines of the Portuguese melody combined with the life-giving heartbeat of Africa." Musically choro is based on what we know as samba-style or bossa nova rhythms and played on a guitar or other fretted stringed instrument, plus flute or clarinet and percussion. Structurally it is the Brazilian music that is closest to European classical music (it borrows the form of the Chopin waltz and the counterpoint of the high Baroque period), yet retains a personality that is all Brazilian. Within its exacting structure, choro is known for the large leaps in its melody and its dizzying speeds, surprising changes of harmony and improvised sound. This is extremely virtuosic music that is played to sound very natural and spontaneous. Choro was developed as an almost purely instrumental rather than vocal style because of the musicians' sheer love for playing. All-night jam sessions, called sauras or rodas de choro, became very common from the 1920s to the 1940s, and at these gatherings the players formed an almost spiritual connection with their music. To be accepted at the sauras one needed to be a good enough instrumentalist as well as understand the musical "code words"—the language of improvisation. One of the most important and prolific composers of choro was Pixinguinha, whose "Segura Ele" ("Grab him!") we hear played this week by the Robison-Lubambo-Baptista Trio. Pixinguinha, one of the greatest flute players and improvisers of his time, has been called "the Bach of choro" by musicologists because of the near perfection of his harmonic structure, his virtuosity and the complexity in his music. He was at the height of his performing career through the 1920s, '30s and '40s. In 1922 Pixinguinha went to Paris with his group, the first Brazilian group to be contracted to perform abroad, and developed a devoted following in France as well as his native Brazil. Another choro master was Jacob do Bandolim (his name translated from the Portuguese is "Jacob of the Mandolin"—he was born Jacob Pick Bittencourt), one of the greatest mandolinists in Brazil. He performed and recorded his music in the '40s and '50s, and was a popular figure on Brazilian radio. Choro began to fall out of fashion in the mid-1950s, and by the '60s it was difficult to hear this music anywhere in Brazil. But in the '70s a rebirth occurred, and a new generation of choro musicians emerged. This revival has continued, in an effort to preserve the music that "is Brazil" to those who hear it and play it both in that country and lucky for us, on the radio!